When I say agility, what do you think of? Let me guess: running through agility ladders in different patterns, weaving around cones, speed, and quickness, right? In a video posted by Sport Science Collective, we can see an athlete training for what is commonly mistaken as agility. He moves his feet in and out of an agility ladder with such great speed that they look like a blur. He cuts around cones so quickly and precisely that it’s difficult to fathom how he can even think about moving in such a way. The video then presents the question, “Is it applicable to this?” followed by clips of elite football and basketball players cutting around defenders in all different directions and at various angles. According to a study done by Young et al. titled “Agility and Change-of-Direction Speed are Independent Skills: Implications for Training for Agility in Invasion Sports,” agility is most recently defined as “a rapid whole-body movement with change of velocity or direction in response to a stimulus.” The key phrase here is “in response to a stimulus”. More often than not, in sport, the stimulus is an opponent whose actions cannot be predicted. Therefore, agility requires quick reaction and decision-making skills. Without a stimulus or force acting against the athlete, we simply have Change of Direction Speed (CODS), or the ability to change initial direction to a predetermined location. For example, a baseball player runs 90 feet to get to first base, followed only by left turns. No matter what, the bases will always be at their pre-determined locations. As per regulation, the bases are the same distance from home plate and the batter will only take left turns on his/her path back to home. In the video I previously described (above), the athlete-in-training knew ahead of time what pattern set he was going to follow on the agility ladder, and in what direction he had to weave around the cones. Long story short, a “stimulus” separates agility from change of direction speed. Agility is formed by cognitive, physical, and technical aspects, each of which consist of multiple components that can be trained for and practiced (Figure 1). The cognitive aspect includes decision making speed and accuracy. The physical aspect includes leg muscle qualities, core strength, and straight speed. Interestingly, the physical aspect is very closely related to change of direction speed, which, as mentioned previously, is often mistaken for agility training. Rather, it is a component of the physical aspect of agility. Finally, the technical aspect includes feet placement, adjustment of steps to accelerate, as well as body lean and posture. So how do we improve agility specifically for sport? How do we prepare to react to an unpredictable stimulus? As we have already established, “agility skill requires the ability to perceive relevant information about opponent’s movements and react quickly and accurately.” The Reactive Agility Test (RAT) allows the athlete to test and train for game-like scenarios. In this test, a Y-shape configuration (Figure 2) is used with a screen that uses a mock stimulus (e.g. 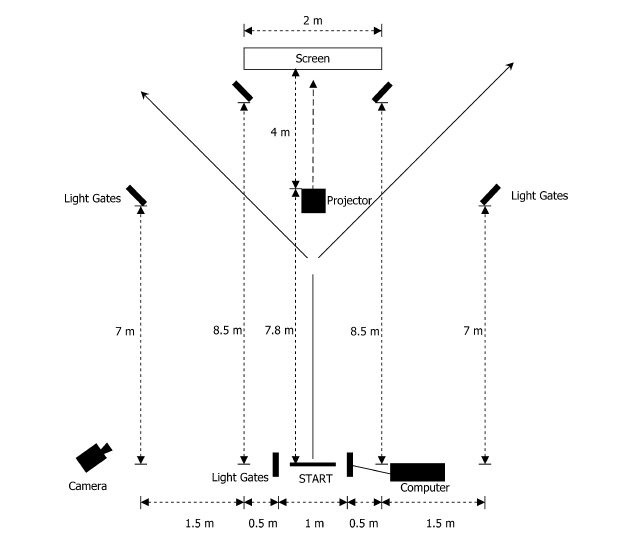 a video of an athlete or a light beam) performing particular movements, to which the athlete being tested must react. The stimulus’ change in direction forces the athlete to react while moving at a rapid pace. A timing gate system records the planned time, reaction time, and decision time. Just as in a game where a defender must anticipate and react to the offender’s movements, the test subject must do the same with the mock stimulus in this agility test. Agility is vital for successful performance in most sports. Defenders must react to the attacking team’s movements while the attacking team must adapt to the defenders’ advances. Generally speaking, sports consist of movements and countermovements. A lack of cognitive, physical, and technical aspects of agility will result in the inability to achieve optimal results and failure to progress. The purpose of this article is not to bash change of direction speed training. Agility ladders, cones, and mini hurdles are great for developing footwork skills, coordination, and even muscular endurance. With that said, in order to develop and improve agility for sport, decision based training and small sided games are much better options, because they prepare the athlete for game-like situations cognitively, physically, and technically. “Agility.” Science for Sport. N.p., 24 Apr. 2016. Web. 07 July 2016. Frederickson, Aaron. “Benefits of Small Sided Games on Youth Players Is Consequential.” IMSoccer News. N.p., 14 Feb. 2012. Web. 07 July 2016. Nimphius, Sophia. High-Performance Training for Sports. Ed. David Joyce and Daniel Lewindon. N.p. : n.p., n.d. Print. Sheppard, J.M. and Young, W.B., Agility Literature Review: Classifications, Training and Testing, Journal of Sports Sciences, 2006, 24: 919-932. “What Is Agility?” Sport Science Collective. N.p., 30 May 2016. Web. 07 July 2016. Young WB, Dawson B, Henry GJ. Agility and Change-of-Direction Speed are Independent Skills: Implications for Training for Agility in Invasion Sports. International Journal of Sports Science & Coaching, 2015, 10(1). 159-169.